55 days. Cucurbita pepo. 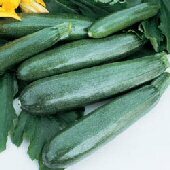 (F1) Plant produces heavy yields of green zucchini squash. This exceptional quality variety is best when harvested 8" long. Great freezing and canning zucchini squash. Always a great seller at Farmer’s Markets! Excellent choice for home gardens and market growers. A summer squash variety.